When it comes to buying a house, there are an overwhelming number of factors to consider and decisions to be made. Having a solid idea of what it takes to buy a house is essential to any home buyer, especially if purchasing a house for the first time. Without this knowledge, you’re faced with a significant struggle as you muddle through trying to find an agent, understanding contracts, terms, closing costs, escrow, etc. History of Houses - When Did All of This Start? Other than evidence of home structures that were as simple as a hole dug into the earth surrounded by large stones or a cave in the side of a mountain, people lives in tents made from animal skins. Around 4,000 BC, people began to live in huts constructed from stone or wattle and daub (interwoven sticks/twigs covered in mud or clay). Around 6,500 BC, houses were built out of mud brick. These homes didn't have doors but, instead, the entrance was a hatch in the roof. Around 7,000 BC, mortar came into play and was used to plaster walls and floors making for more stable structures. In the United States, the oldest house is most likely that of George Washington, the Mount Vernon House, located outside of Washington, DC. Built in 1727, this house still stands along with 2 additional buildings. It is privately owned, offers daily tours and is supported by the sale of tickets and charitable donations. Currently the home is most likely worth over $5 million. Today it is estimated that over 127 million homes exist in the U.S. Let's take a look at what you need to know before buying one of these homes. A mortgage lender is going to look at your FICO score to determine whether or not you qualify for a loan. Depending on the type of loan you qualify for, your credit score requirements will vary. FICO is looking at credit information that helps lenders determine behaviors like whether or not you can pay your bills on time and if you’re able to handle a bigger credit line. Credit scores range from 300-850 generally, the highest number representing the least risk in the eyes of your lender. Although every lender has different standards, 700-749 is considered an excellent score, 650-699 is fair, and 300-649 is considered poor. The higher the score the more likely the lender will want to loan you money to buy a home. If you have a poor credit rating, it’s likely you can still qualify for a FHA loan (lowest credit requirement) but will need a 10% or greater down payment. A credit score of 620+ is required for conventional, VA, USDA, and FHA 203K loans (you can qualify for some FHA loans with a score as low as 580). Your credit score will affect your interest rate. Expect to pay higher mortgage rates and increased closing costs if you have a poor credit score. Take a look at your credit report and dispute any errors as they can lead to disqualification for a mortgage loans. If you have a low credit score, take measures to improve it before applying for a mortgage. Some examples include paying off your credit card each month or at least paying down the balance as low as you can get it. If you have collections on your credit report, contact the collection agency and ask for “pay for delete”. 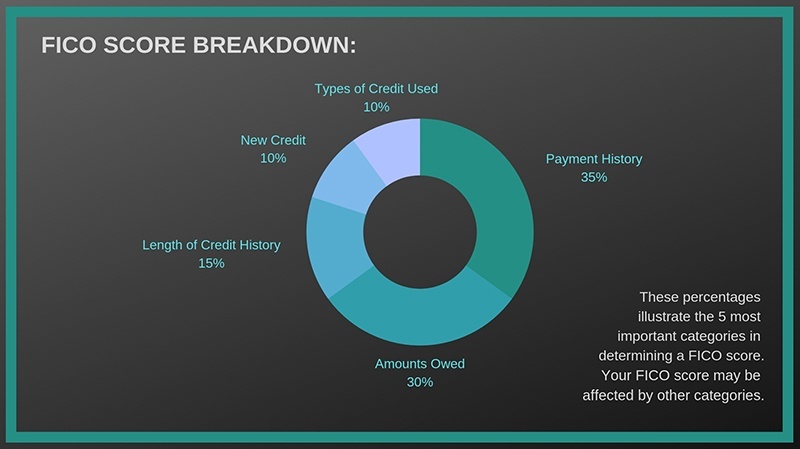 This is where you pay the balance and the creditor removes it from your credit report, improving your score. An amortized loan has scheduled periodic payments which include both principal and interest. 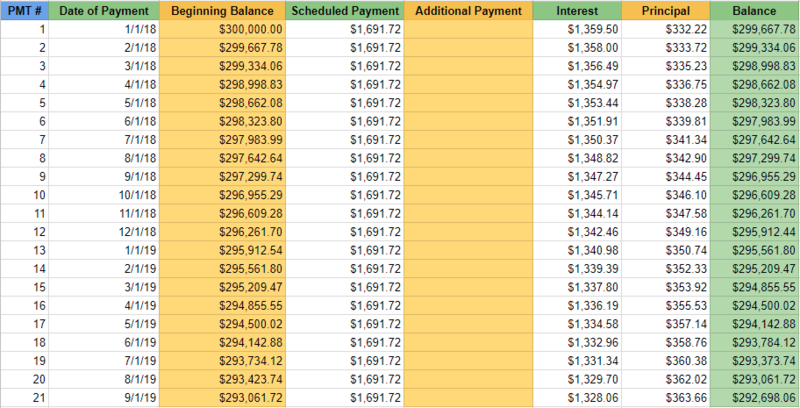 An amortization table outlines the process of paying off a large loan in fixed installments over a fixed period of time. The table includes the amount of each monthly payment, interest charges and principal amount. 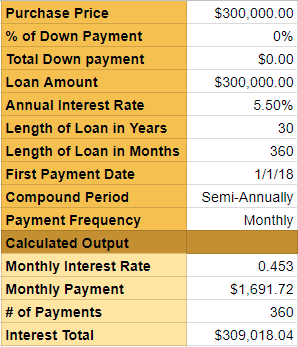 When you decide how much you want to spend on a home and how much of a loan you’re going to need, plug the numbers into a amortization calculator to visualize the impact of your payments over time. Simply enter the loan amount, interest rate, number of payments, and the payment amount, and the calculator with churn the numbers for you. With a fixed mortgage rate, your monthly payment remains constant and the interest decreases the closer you get to paying off the loan. You can still use a amortization table if you have a variable interest rate or lines of credit, but it can be more challenging. Once you purchase a home, consider making a double payment once in awhile to help reduce the amount of interest you’ll and to pay off the loan quicker. If you were scheduled to pay $500/month and you paid $1000, 2x per year, you would save hundreds on interest (on a $100,000 loan). Talk to your lender before making extra payments to ensure the payments are going towards the mortgage principal. Utilities include gas, electric, water, sewer and others. Be an informed buyer and learn the cost of utilities in the home you’re about to purchase. If this is your first home purchase, know that the cost of utilities will likely be higher than what you experienced while renting. You could end up paying 25% more than expected once you add up the cost of gas, electric, water and sewer fees. That could add up to over $200/mo. Of unexpected expenses. So if you budgeted $1200/month on your mortgage and suddenly you’re faced with an additional $200/month in utilities, you could be in over your head. It’s best to keep utility costs below 25% of monthly costs. If higher, you might consider figuring out ways to make the home more energy efficient or ask seller to make changes or work fees into the contract. Your agent can provide historical information on the utility bills from the home you hope to purchase. You can also ask the seller to provide the last 12 months of utility bills, ask utility companies for an estimate or go to https://www.myutilityscore.com/. Your home inspector can provide more information on what it would take to make the home more energy efficient (ex. New furnace). You might even look into whether or not you qualify for a mortgage that will help with the cost of energy efficiency like an Energy Efficient Mortgage (EEM). This type of mortgage credits a home's energy efficiency into the mortgage. EEMs allow borrowers to qualify for larger loan amounts on homes that are already energy efficient (ex. new homes). You will typically be required to have a home energy rater conduct an energy audit before you’ll be approved for this type of financing. Energy Improvement Mortgages (EIM) are geared towards homes that will need to have energy efficient improvements made to them. This type of mortgage typically doesn’t increase the down payment and allows the borrower to use the money saved to make energy improvements. Nearly 80% of potential home buyers begin their home search online. Many look for a real estate agent online as well, researching ratings and customer testimonials. Others consider buying a home without the help of an agent. Below you will find information on both options and learn how to get started on the home buying process. Real estate agent: anyone who passed a real estate licensing exam. Can be licensed as a sales professional, an associate broker or a broker. Required to take continuing education classes annually, depending on the state, to keep their license active. Works under a broker. Real estate salesperson: same as a real estate agent. RealtorⓇ: an agent who is a member of the National Association of REALTORSⓇ. Must uphold the standards of the association and is held to a high code of ethics. Buyer’s Agent: an agent representing the buyer in a real estate transaction. Assists buyers in finding a home. Once a contract has been entered into, a buyer’s agent can also be called the selling agent (the agent who sold the home). Seller’s Agent: Also referred to as the listing agent (listed the home on the MLS). If the seller has signed an exclusive-right-to-sell agreement, then the seller’s agent is entitled to the commission. If not, another agent representing the seller would earn the commission. Listing Agent: Typically the agent representing the seller, as they have listed the seller’s house on the MLS. Experts in marketing homes for sale. Hired by someone looking to sell their home. Also referred to as the sellers agent because they represent the seller. Broker: typically have to work for 1-3 years as a real estate salesperson, depending on the state, and pass a broker licensing exam before earning the title of a broker. They can work on their own or have agents work for them and doesn’t have to hang his/her license with anyone, unlike an agent. Broker Associate: Also known as an Associate Broker or Affiliate Broker. Has completed the educational requirements and experience to obtain a broker’s license but there can only be one broker per firm. Unless there is a need to step in for the Broker, the act as a standard real estate agent or RealtorⓇ. Dual Agent: an agent working for both the buyer and seller. Also known as transaction broker because they represent the transaction and technically not the buyer and seller (varies by state). It’s important to find a real estate agent who is a buyer’s agent and someone you can trust. This mean searching for and interviewing multiple agents before deciding on the one that will represent you and help you make one of the biggest purchases of your life. Don’t feel obligated to hire an agent just because he/she showed you a home and understand that they will likely be interviewing you as well. Talk to your friends and family to learn more about agents they’ve used and how they might be a good fit for you. Hire a licensed real estate agent or, preferably, a RealtorⓇ. These agents are licensed, educated experts with access to more listings than you’ll ever see online, have expert negotiating skills to help you get through bidding wars, deal with counter offers and more, saving you thousands of dollars. Licensed real estate agents understand the real estate language and they can make sense of contract terms and other real estate jargon. They have connections with experts in mortgage, financing, title companies, etc., making it easy for you to get through the entire real estate buying process without having to find these contacts on your own. Although, you don’t have to feel obligated to use who they recommend. Know that some agents work full-time while others work part-time. This is an important factor to consider when looking to hire an agent. If they are working full-time, they will likely be able to devote more time to your house search and be available to show you homes more readily. A part-time agent may still suit your needs but may not be available when you reach out to them with questions. If a market is hot and homes are selling quickly, time is of the essence. A home that’s listed today, may sell by tomorrow morning. In this case, you need an agent who makes him/herself readily available so you don’t miss out on homes in a fast moving market. Ask them how many clients they’ve served. Just because they’ve been in business for 5 years doesn’t mean that they’ve served many clients, especially if they work part-time. Also, ask how many clients they’re currently working with to determine how available they will be. Look at agent reviews online and know that some might possibly be fake. Facebook can be a good resource of reviews, especially since you can look up the person to see if they’re real or not. You can even use direct messenger to learn more about their experience with the agent. Visiting your lender to get pre-approved for a mortgage loan is an important step before you begin searching for a home (unless you're buying with cash). If you don't know how much money you're qualified to spend on a home, you'll quite possibly waste time looking at houses you cannot afford. Imagine finding the home of your dreams only to learn later that you're qualified for a lesser amount. Wondering where to find a lender? Talk to friends who have gone through the process of buying a home and ask if they would recommend their lender. Talk to your bank or local credit union. If you already use a mortgage broker, speak with him/her to learn about lenders your broker may work with. For a quick and easy approval process, you may be able to fill out an online pre-approval form associated with the lending institute. Once you choose a lender, they will look at your credit score, income, debt ratio, and overall financial situation to determine if you're qualified for a loan, and if you are, the type and amount of loan. If you qualify for a loan, the lender will provide the maximum loan amount. This is not a guarantee. Once you make an offer on a house, you will give your lender a copy of the purchase agreement and wait for final approval. The final approval process involves more underwriting and therefore will take longer then the pre-approval. Other benefits come from getting pre-approved. The process will make you aware of any existing issues (ex. low credit score) that affect the amount you're pre-approved for. The sooner you correct the issue(s), the better. Also, real estate agents are more likely to work with you if you've been pre-approved. Finally, when the time comes to make an offer on the house, you will be a step ahead of any potential buyer that didn't get pre-approved, which will make you look better in the eyes of the seller. Most agents will ask for a pre-approval letter before they show you homes. This way they know which houses, priced up to your pre-approval amount, to show you. It could get frustrating for you and the agent if you go looking for homes prices well outside of what you can afford. You may have heard of getting pre-qualified as opposed to getting pre-approved. Sometimes the terms are used interchangeable so you'll want to ask your lender how they define each. When you get pre-qualified, you go through a much simpler process. Your lender will look at a basic, overall view of your financial information (ex. income and debts), some self-reported vs. documented, then give you a general idea of the amount they might be willing to lend you. To save yourself a headache later, consult with your lender before looking at homes, get pre-approved or pre-qualified for a mortgage, and look for the best mortgage rates. Your agent’s broker may ask you to sign a buyer’s agreement, otherwise known as a exclusivity agreement, a buyer’s broker agreement or buyer’s representation agreement. Signing this agreement will cement an exclusive working arrangement and formalize the relationship. The agent will become your exclusive buyer agent, dedicated to working on your behalf. It’s important to make sure you understand your agent’s values and motives in helping you buy a home, before signing on the dotted line. You’ll know when you’ve found an agent that fits. If you have doubts, interview other agents to see if you can find a better fit. It’s important to know that the terms of the agreement are negotiable. If you don’t want to sign a 90-day commitment, you can negotiate for a shorter period, say 30 days. You can even delay the signing by letting the broker know you would prefer to spend a day or two with the agent to ensure it’s a good fit. You can then decide whether or not you want to work with the agent and sign the buyer’s agreement or move on to a different agent. As an option, you can ask the broker find you a different agent, from the same office. This agreement protects the broker and agent. Keep in mind, the agent is essentially working for free until you buy a home through them and they earn a commission. If they spend a significant amount of time showing you listings, then you suddenly decide to go with a different agent, they’re out a lot of time, effort, and essentially money. If you sign the agreement then decide to switch to a different agent, the original agent will receive compensation if you buy a home the initial agent introduced you to. They want to know that their commitment to you will be compensated once you buy a home and they, in turn, earn a commission. With a exclusivity agreement, you’ll want to look closely at the terms and conditions. In the agreement, you can determine which areas and price ranges you wish to commit to. If you later decide to have another agent show you homes outside of said areas, you will not be violating the agreement. You can also ask for a guarantee with the exclusivity agreement. If the relationship isn’t working, on either side, you can be released from the agreement. Take time to convey your concerns, as there may be room to fix them. Out of respect, always let the agent know if you decide to sever the relationship vs. just walking away. Make sure you get the cancellation of the agreement in writing, signed by both parties. It is possible to buy a home without the help of a real estate agent, but there are factors to consider before going solo. There is a lot of research involved when searching for a home, albeit the internet will make your search easier. Unfortunately, you will not have access to the kind of information an agent have access to. That includes stats on sold and expired listings and how they compare to current market conditions. Also, agents will know neighborhood comps and current market conditions better than anyone. You will be able to find some of this information through tedious research, but you not have the benefit of hearing an expert explain the information and how it will affect your ability to purchase. When you decide on a home you wish to purchase, hire a home inspector. The money you spend could save you thousands in the end, especially if the inspector find something seriously wrong with the house (ex. roof issues). You could use issues found in the inspection to negotiate a better contract and possibly have the sellers pay for the repairs before the sale is finalized. You will need to find a mortgage on your own. It will require a lot of research to ensure you’re getting a lender that has a reputation for closing on time and is offering the best rates and terms. Hiring a real estate attorney is encouraged when buying a house without a real estate agent. An attorney can make sure everything on the contract is legal and explain any areas of concern, contingencies, or other confusing jargon. Also, you’ll quickly learn if the seller doesn’t know what he/she is doing and when it’s time to move on. Do your homework before making an offer on a FSBO. The homeowner may have decided on a sales price without much consideration for the true market value. You will need to learn how much comparable houses sold for in the same neighborhood then come up with an offer based off of those numbers. If the seller is selling for a lower price, they may be hiding a hidden cost (ex. non-permitted addition to the home). Ask around for advice on a good home inspector and get the home inspected. Use the inspection results in your favor to decrease the cost of the home due to out-of-date wiring, for example. Build contingencies into the purchase agreement to protect yourself. You want to be able to cancel the contract without penalty, if repairs aren't made by the time you close or the price isn't adjusted to compensate for the cost of repairs. Be aware of home disclosures which are required to be released by real estate agents when they’re selling a home but which might not be disclosed with a FSBO. For example, the federal government requires sellers to disclose lead-based paint if the home was built before 1978. If you aren’t working with a real estate agent, you may not receive this information. If you buy the home, you are exposing yourself to harmful lead and will pay a generous price tag if you decide to have it re-mediated. Material facts are also required to be released by real estate agents. For example, in some states the seller has to reveal if someone died in the home within the past 3 years. Other disclosures might include external factors such as if the home is in an earthquake or flood zone. Another important consideration, when buying a FSBO, includes the need to buy title insurance. You need this insurance to protect yourself against financial burden due to a problem with the house after closing. Don't hesitate to ask the seller to cover all or part of the cost. If your lender is concerned about title issues, you and the seller should be concerned as well. If there is a problem with the title report, the title insurance company will fix the issue, if possible, or pay for damages resulting from the issue. The title insurance company will make sure there are no liens on the home or work to remove any that exist (the title needs to be free from liens and encumbrances). Without title insurance, you putting yourself at risk of losing money you've invested in your new home and possibly the house itself. The expense of title insurance will be worth it if you need to put a claim on the policy. A mortgage is a debt secured by the collateral of the home you’re buying and obligates you to pay the debt back with a predetermined series of payments, with interest. With a mortgage, you can make a large purchase without having to pay the entire amount up front. Along with the mortgage, you’ll be paying mortgage interest (aka: mortgage rate) which is a percentage of the mortgage which must be paid in addition to the principle. The amount of interest paid on the mortgage is quoted as an Annual Percentage Rate (APR). Interest rates vary throughout the year and may be fixed or adjustable. If you have a fixed rate mortgage, you will be paying the same payments throughout the life of the loan. An adjustable mortgage rate will leave you paying varying rates throughout the life of the mortgage. Conventional loans are not backed, insured or guaranteed by the federal government in any way (ex. FHA, VA, USDA). Instead, it conforms to GSE (government-sponsored entities) guidelines (Freddie Mae and Fannie Mac) who helped standardize mortgage lending in the U.S. They are a lower cost mortgage option with more stringent standards. No additional mortgage insurance payment for a borrower who can make a 20% down payment. Can’t put 20% down at closing? You can still have your mortgage insurance removed, once you reach 20% in equity. Conventional “Portfolio” Loans: Loans held directly by mortgage lenders vs. being sold to investors, as with other conventional loans. Lenders can set their own guidelines for portfolio loans, making it a bit easier to qualify. Sub-Prime Conventional Loans: Available to borrowers with questionable or even poor credit. Interest rates and associated fees are usually quite high. Amortized Conventional Loans: Conventional loan options: fixed- and adjustable-rate mortgages (ARMs) with 15, 20, 25, and 30-year terms typically. Fixed-rate Mortgages: Have the same fixed rate throughout the life of the loan. In other words, your monthly payment will always be the same. 15-year fixed rate mortgage: Borrower pays off mortgage quicker and typically at a lower interest rate but has higher monthly payments. You’ll pay less than half of the total interest cost of a traditional 30-year mortgage. On the other hand, you may not have the maximum mortgage interest tax deduction possible. 30-year fixed rate mortgage: Many prefer because it spreads payments over a long period of time and the monthly payment is lower than a 15-year mortgage. This mortgage will likely be paid off before retirement age and then you will own your home outright. ARMs: Have rates that fluctuate, saving you money at times and costing you more at other times. The initial rate will likely remain fixed for the first year, then change/adjust after that. Variations of this type of mortgage exist, like the 5/1 ARM loan where the rate is fixed for the first 5 years then adjusts annually. Buyers who don’t plan on staying in the house for very long may want to take advantage of this option. Basic FHA-Insured Home Mortgage: US Federal Housing Administration mortgage insurance backed loan from a FHA-approved lender which helps those with lower incomes borrow money for the purchase of a home. A form of federal assistance designed to help you buy a single family home. It insures the mortgage for the lender in case you default on the loan. You will pay 2 mortgage insurance premiums, upfront mortgage insurance premium and a monthly mortgage insurance premium. VA Loan: Guaranteed by the US Department of Veteran Affairs (VA), issued by private lenders, requires no down payment and is available to veterans, service members, eligible military spouses. Rural Housing Loans: USDA’s single family housing program provides loans or loan guarantees to help those with low- to moderate-incomes buy affordable houses in rural areas. Requirements include, but aren’t limited to, being without adequate housing but have the ability to afford housing payments and have an acceptable credit history. You may find yourself in a position where you’re qualified to spend way more than you anticipated. Although you’re qualified to spend $400,000, for example, you may want to consider spending less so you don’t end up spending the majority of your paycheck on your mortgage each month. Trulia recommends limiting payments to no more than 30% of your monthly income (ex. if you earn $3000/mo., you wouldn’t want to pay over $900 for your mortgage). When you find the right home, it’s equally as important to find the right lender. Mortgage rates vary, making it a good idea to shop around for a lender. You could save thousands of dollars when you find the best terms and lender. If shopping online, keep in mind that some loans will not be available in all states and some companies, like Quicken Loans, do no offer HELOC or home equity loans. Be thorough in your investigation and ask friends for advice on their loan experiences. If shopping locally, you might start with the bank you currently belong to but branch out and try other banks and lenders as well. Once you start looking around, you may find that your bank isn’t as competitive as other local lenders. Be aware of mortgage amounts calculated on sites like Zillow, as they can be misleading. Compare to other sites to get a better idea of mortgage payments. Be aware that many sites use teaser interest rates to hook you. In other words, they make the monthly mortgage payments more appealing by plugging in rates that are below current rates. Consider using a mortgage calculator associated with your bank to get a better idea of expenses associated with purchasing a home, at current interest rates. Keep in mind that the calculator only takes into consideration the information you provide. Plug in the price of the home, current interest rate, loan term (length of the mortgage), property tax, etc. After you’ve plugged in all the pertinent numbers, view the loan breakdown. This will provide you will an overview of how much you’ll pay in interest, taxes, principal, and insurance over the life of the mortgage. Let’s say you look at an online listing for $495,000, and the mortgage calculator shows monthly payments are $2060. When you add in property taxes, home insurance, utilities, and possibly HOA fees, you may end up spending closer to $2700/month. That’s a difference of nearly $700/month. In addition, as interest rates change, so will the amount of the monthly mortgage payments. If you’re looking at houses over a long period of time, always be aware of changing interest rates. In other words, don’t assume your only expenses will be reflected in the mortgage calculator. Making a budget for the purchase of your new home is vital. It’s important to look at all monthly expenses incurred in the purchase of a home to ensure you stay within your budget. Before buying a home, set aside money each month, as if you’re paying for a mortgage. Take a look at how much you’re already spending monthly on rent, utilities, gas, groceries, childcare, clothing, phone, savings, etc. Look at which expenses are necessary (ex. utilities) and which are optional (ex. eating out or new clothing). Then, take a look at your monthly income. This might include a spouse’s income and money you make from a hobby. Subtract your monthly expenses from your monthly income. This is the amount you’ll want to set aside each month, as if you were paying a mortgage. If you realize you’ll only be able to set aside a small amount, say $500/month, consider which expenses you can get rid of. For example, if you spend $200/month eating out, consider cutting that budget in half or eliminating it all together. If you drive your vehicle to work each day, save money by taking the bus at least a few days per week. With changes like these, you’ll grow your mortgage fund much faster and be able to afford a 10-20% down payment. Once you’ve got an idea of what your current expenses are, consider the expenses you will have once you become a homeowner. HOA fees, water, sewer, gas, garbage, etc. Larger expenses include homeowner’s insurance and property taxes. Insurance and tax information can be obtained from a real estate agent, people who live in your target neighborhood, or by contacting city agencies. Once you have an idea of homeowner expenses, adjust the amount you’re setting aside each month to compensate. Before making an offer on a home, get pre-approved for a loan. The pre-approval is basically a promise from the lender that you’re qualified to borrow a specific amount of money at a specific interest rate. During the pre-approval process, you will be required to fill out a mortgage application and pay a mortgage application fee ($500 +/-). Pre-approvals are typically valid for 60-90 days. Visit a lender to get pre-approved for a mortgage loan or talk to your real estate agent for recommendations. The lender will look closely at your credit and verify your income, as well as the information listed below, during the pre-approval process. There is no guarantee that your loan will be approved. If you’re application gets rejected, consider getting a second opinion from a lender. There is also a chance that your pre-approval will get denied later. Reasons can vary from changes to your credit score, incurring additional debts after being pre-approved (ex. taking out a car loan), or changes to the lender’s loan requirements or guidelines. Most real estate agents will ask for a pre-approval letter before showing you homes to ensure they’re showing you what you can afford. Looking at homes that are far more expensive than your pre-approval amount is a waste of time for you and your real estate agent, but that happens when people don’t go through the pre-approval process. Imagine the disappointment of looking at a $500,000 home that fits all of your needs, then getting pre-approved and learning you’re only qualified for $400,000. You might consider looking at homes below the amount you’ve been approved for. For example, if you’ve been approved for $400,000, start looking at homes priced between $325K-$350K. You may find exactly what you’re looking for and save a significant amount on your monthly payments. Then when you decide to look at homes closer to $400K, you’ll have a better idea and appreciation of what an extra $25K-$50K gets you. Keep in mind, a turn-key, higher priced house, includes higher monthly payments and additional expenses. Getting pre-qualified for a mortgage is not the same as getting pre-approved. Pre-qualification is simply sitting down with a lender, going through an informal process of being interviewed about your assets, income and expenses, and walking away with a general idea of what you can afford. This can be a good starting point for those who are not planning on buying a home for quite some time or just want to get the ball rolling as they prepare to save for a down payment. When you find a house that you wish to make an offer on, what should you expect to happen? Although your agent cannot tell you what price to offer, he/she can provide information that will help you make a reasonable offer. For example, your agent can provide information on whether you’re in a buyer’s or seller’s market. In a buyer’s market, things are in your favor. There are a lot of houses available and sellers have a lot of competition. If you’re in a seller’s market, the market is in favor of the seller. There may be few houses available and sellers can ask higher prices. The time of year is another factor to consider. Depending on where you’re buying a house, off-season can provide more room for negotiating a better price (ex. winter in the north). If you’re looking to buy in prime season (ex. summer months), you might find it more difficult negotiate a lower than list price offer. Another favorable move during a bidding war is having your agent call the listing agent. This will give the seller an opportunity to ask any questions and get clarity on your offer. In some cases, this could make the difference between your offer standing out vs. looking like all of the others. When you find yourself in a bidding war, keep in mind that submitting an offer at the extreme top of your budget may leave you with regret if you do win. Adding an escalation clause (willing to outbid other offers by a specific amount, up to a ceiling price) to your offer may also lead to regret as you end up spending thousands over what you could afford. If you’re going to bid high in a bidding war, make sure you understand the ramifications. Instead of logically making a decision to buy a home, some buyers get emotionally attached and don’t think they can live without the home, no matter what they have to pay. You end up buying a 1400 sf home when you really needed a 2000 sf home. Or when downsizing, you end up buying a home that’s twice the size you need (or want to clean) because it reminded you of the house you were raised in and you just couldn’t pass it up. If you find yourself emotionally wrapped up in a home you wish to buy, stop and look at 3 things. Is the house in your price range? Does it match the number of rooms and sf you and your family will need? When you know what you can afford, it’s less likely you’ll overspend. That’s where the pre-qualification or pre-approval comes in handy. If you’re pre-approved to spend $400,000, don’t go over that amount when looking at homes and making offers. You might even consider buying less house than you can afford. On the opposite extreme, sometimes it can be tempting to spend too little which can lead to regrets as well. If you end up buying a home for much less than you originally budgeted but it offers less square footage than you need, you will likely outgrow it quickly. Buying a house with 2 bedrooms when you have 2 kids, and 1 on the way doesn’t make much sense and you’ll likely end up moving again w/in a couple of years… with 3 kids in tow. Save yourself a lot of work and time by making a sensible home purchase the first time around. Compromise is the name of the game when it comes to getting a home at good price that meets most of your needs. In other words, you can live with outdated decor if it means getting a home at a good price in your favorite school district. The money you saved can be put towards future remodels. Compromising on the number of bedrooms when you’re growing your family can be a mistake, as previously mentioned. You will get a better idea of what you truly want and need by viewing a lot of houses. Start online then visit open houses and schedule showings with your real estate agent. Your perspective will change a lot once you’ve actually stepped into a home (have you noticed how the online photos make rooms feel a lot larger than they actually are?) Once you’ve got a good amount of viewings under your belt, you’ll be able to make comparisons and know what you can and cannot live without. There’s a lot to consider when buying a home. For instance, if there’s construction in the neighborhood you choose, you’ll want to talk to your real estate agent about the pros and cons. Maybe you could negotiate a lower prices, especially if it isn’t new construction. Find out how long construction will be going on, as you’ll have to live with the noise, equipment and dust. Ask your real estate agent if the construction will add or detract from the value of the home. Take into account what structures, besides houses, are being built. For example, if a bridge or an interchange is being built in the area. Think about how this is going to affect the amount of noise in the area (while being built and after), traffic, your commute time. Ask your real estate agent to look into the building of structures like these. Zoning is another factor to consider. Are you in a strictly residential area or is it zone commercial too? In some cases, you might find homes being converted to businesses. Depending on the type and size of the business, it will bring more traffic to the area and might congest streets with more vehicle parking. Are there rentals all around the house you intend to purchase? This can bring down the value of your home, especially if you aren’t planning on renting the house you’re purchasing. In addition, it may make it more difficult to sell in the future. If home values are declining in the neighborhood you’re interested in, talk to your real estate agent about the pros and cons. If nearby areas are being gentrified, the value of the home may increase as more middle-class and affluent people move into the area. On the other hand, if your agent reports that the area has been declining and prices have been falling for many years, you may want to reconsider. Your agent can look at purchased and sold prices for homes in the area over recent years and give you a better idea of future projections. Also, take into consideration high crime rates and low school rankings. When it comes down to the property itself, you’ll want to find out if there are existing easements or right of ways. An easement provides the right to use another person’s property for a stated purpose. In other words, say your property is in between a neighbors and access to National Forest land. You may choose to provide access across your property in the form of an easement so you’re neighbor doesn’t have to travel to find public access to the National Forest land. Some easements provide utility companies with the right to install power lines or bury gas pipelines across land. Others allow for the future installation of a water storage facility. A right of way is a type of easement which gives someone the right to travel across property you own. This might include a road or a path through your property. It’s meant to benefit a specific person or different parcel of land not owned by you. Talk to your real estate agent or a real estate lawyer if you have concerns about easements, right of way, or even the boundaries of your property before settling on a contract. It’s important to take time to outline the costs incurred from moving. You might be surprised at how much you’ll be spending. Consider using a moving checklist to cover all bases. Many online forms are available for download. Depending on how much time and money you have, consider hiring a moving company. Find out if they include moving supplies in the overall price. Many companies charge extra for boxes, packing materials, and tape. With many moving companies, you will be in charge of packing boxes and emptying drawers and they will be in charge of moving boxes and furniture to and from the truck. If you’re company is moving you, it’s likely they will pay for moving expenses. Ask them to be a specific as possible on what’s included. Are they going to pack your belongings or simply move the boxes from one home to the other? Will they provide a cleaning service? If you’re moving everything yourself, with a moving truck rental or friend’s trucks, you may consider renting furniture pads, covers, dollies (hand trucks). Depending on the size of furniture you’re moving, you may want to rent a forklift. Consider having a storage unit delivered to your property. Some storage companies will drop off the unit, and once it’s filled, store it until you need it. When you’re ready to unpack it, they will deliver it to your new residence. This is a great option if you’re thinking about packing rarely used items well ahead of the move. It’s also a great option if you’re selling your home and will be holding open houses. Less clutter makes it easier to sell. Besides the obvious moving expenses, you might want to think about expenses related to your current lease. If you’re currently in a lease, find out what it will cost to break it. If the fee is hefty, you may want to time to purchase of your home towards the end of the lease or see if your landlord will let you go month-to-month following the end of a long-term lease. Don’t forget the cost of cleaning supplies or a cleaning service. If you are doing your own cleaning, have buckets, mops, vacuums, rags handy so that you can clean up as you empty rooms. If you’re hiring a cleaning service, do it well in advance of your move and as moving day gets closer, communicate when you’ll need them to at your house. You may want to meet with a cleaning company at your home before you even begin packing. Be specific about the amount of cleaning you’ll need. Are they going to deep clean carpets? Wash windows inside and out? Clean appliances? Make it clear so you’re not responsible for additional cleaning after they’re gone. Utilities are another expense worth thinking about. Estimate what your final utility bill will be at your current residence. In your new residence, estimate what it will cost to set up utilities. Set aside money for both. You may be eligible to deduct moving expenses from your taxes. In 2018, active duty military families are the only people that can claim a tax deduction for moving expenses. If you didn’t have to finance your home with a mortgage, you may not be required to get homeowners insurance. Otherwise, your lender will require it to protect your home in case of damage due to unforeseen circumstances like natural disasters. Insurance premiums are affected by a lot of factors including the location of the home, if there are protective devices installed (ex. Burglar alarms, smoke detectors, deadbolts, etc. ), if you’ve owned a home before and have a history of claims on a homeowners insurance policy, as well as home features like the age of the home, wiring, roof, etc. Private mortgage insurance is necessary if you have a conventional loan and cannot put down at least 20% on your home purchase. It protects the lender if you stop making payments on your home loan. Finding a good real estate agent means finding a good negotiator. Don’t assume all agents will negotiate for you. You might want to bring up opportunities to bargain for what you really want. Ask around and you will learn that most anything can be negotiated when prepared to buy a home. Want to offer a lower purchase price? Want the 12-year old water heater replaced? Want the seller to pay part or all of the closing costs? All of these can be negotiated and included in the purchase agreement. Some sellers will not include appliances in the sale of their home. After negotiations, they may include them as a bonus in the contract. If you attempt to negotiate for new appliances and fail, keep in mind that you can donate the old appliances to Goodwill and use it as a tax write-off. It’s common for buyers to ask for a home warranty and the seller to pay for the first year, as part of the contract negotiation. A home warranty is an annual service contract that covers the repair of heating and air systems, plumbing, appliances, and other systems that break down over time. If the seller agrees to the home warranty, it is typically called a seller concession or contribution. Talk to your agent about negotiating on your behalf so you get what you want at the best price. As a buyer, you will typically put down earnest money with your offer. Earnest money is a good-faith gesture letting the seller know you’re serious about buying the house. Typically you will put down 1-5% of the home purchase price, as determined by the seller. Once the deal is finalized, the earnest money will go towards your down payment. The money is held an an escrow account, not be the actual seller. You can lose the earnest money if you do not pay attention to contractual deadlines, which is part of the responsibility of a good real estate agent. Deadlines attached to earnest money are typically set 2-3 months in the future to allow time to complete the deal. Your contract will have built-in clauses that will allow you to get out of your contract if certain contingencies or factors aren’t met. If these factors occur, you can get out of the contract, pending other stipulations. For example, let’s say you ordered an inspection of the home and it failed miserably. You can walk away from the agreement and get your earnest money back. A real estate buy-sell agreement, or purchase agreement, can be overwhelming as you prepare to finalize the purchase of your new home. That’s where an experienced real estate agent or real estate attorney comes in handy. They can explain the importance of each section and the fine print of the real estate contract. Must contracts will include that the house is being sold “as is”. This terminology simply means that the house is being sold as is at the time the contract signing, and the seller is no longer obligated to repair any issues. In other words, when you move into the house it will be in the same condition as when you signed the buy-sell. If something were to malfunction or break (ex. water heater failure) shortly after the closing, the seller would likely agree to have it fixed or replaced. Contingencies will come up in most contracts. A contingency is simply a condition of the agreement that needs to addressed before the transaction can be finalized. An inspection contingency is a good example of what might be included in your contract. This type of inspection protects you, the buyer, and provides information on the condition of the home including whether or not there is a mold or foundation issue. You will receive a report from the inspector, which includes recommendations on how to remediate issues with the home. At that point, you can negotiate with the seller on repairs. If an agreement cannot be reached between you and the seller, you can walk away for the sale. As a buyer, you will not sign the contract until all contingencies have been completed and both parties agree to all terms of the legal contract. An addendum is a document that gets added to the purchase agreement and includes things like buyer requests that weren’t included in the original agreement. This will be drawn up by the agent and will require your signature. In most cases, the addendum will override the language or original terms of the contract. An example of an addendum might include a request to have the seller pay a portion of the closing costs. Once you’ve made an offer, there are things you will want to avoid. For example, you do not want to open a line of credit during the home buying process. Avoid major purchases, including vehicles and new credit cards, until after you close on your new home. It will affect your debt-to-income ratio, which may adversely affect your home loan. Losing a bidding war or winning one and regretting it! When purchasing a house, getting a home inspection is an essential part of the process. An inspection provides you with a chance to learn everything about the condition of the house before purchasing it. A home inspection will cost between $250 - $500 depending on the size of the home, with additional costs associated with some tests like mold and radon. A standard home inspection is usually included as a contingency within the contract, once you’ve agreed to potentially buy a home. Even if the seller has performed an inspection, it’s best to ask for another, possibly with a different inspector. It’s recommended that your agent attend the inspection as there are less-than-qualified inspectors in the marketplace which could leave you with a less-than-thorough inspection. Some real estate agents have a preferred inspector that they trust and have used for years. If that’s the case, the agent may choose to skip the inspection. You can attend the inspection as well, so you’ll see potential problems firsthand, have an opportunity to ask questions, and make sure you know what you’re getting into before closing on the home. If a home inspector comes across something that lies outside of their scope of expertise, they’ll call in a specialist to investigate the issue (ex. radon testing). This will likely cost you more money. Regardless of the cost, you want to follow the lead of the inspector and trust that he/she knows what’s best. Following the home inspection, you will receive a report about the condition of the house. The report will outline issues with the home, potential cost for repairs, and possible future problems with the home (ex. roof problems, foundation problems, outdated furnaces, etc.). Follow up on the inspector’s recommendations, addressing immediate problems quickly to lower your risk of more expensive repairs in the future. Use this report as an opportunity to adjust your offer based off of the reported issues or walk away from the home entirely. If you choose not to have a home inspection, you are left to trust the inspection from the seller. Talk to your real estate agent about this before completely giving up the idea of hiring your own inspector -- the money you spend will be more than worth it in the long run. Having an inspection performed before the sale goes through leaves the seller to handle the reported issues and expenses associated with them. If you decide not to have an inspection done, you’re responsible for any problems and related expenses, after signing the agreement. This is one of, if not the most, expensive purchase you’ll make --- make sure it’s done wisely. A few days before the settlement of your contract, a final walk-through inspection will be performed to ensure home is in the condition in which you agreed to buy it. You will want to attend this walk-through. You want to make sure all agreed upon repairs have been made and nothing has changed with the house since you last viewed it (you might even bring your contract with you as a reference). Making time to attend the final walk-through is of utmost importance. You’ll feel better knowing you’re getting what you signed up for, and you’ll be able to address any last minute issues no matter how big or small. Closing Costs: How Much Will You Need? Closing costs include fees associated with the purchase of a home and include taxes, required insurance, loan origination fees, title insurance, etc. Fees are established by the Federal Housing Administration (FHA), the largest insurer of residential mortgages in the world. Plan on paying 2.5 - 5% of the purchase price in closing costs. Once paid, the contract will be finalized or “closed”. You can include your closing costs in your mortgage, known as no-closing costs mortgage, so you don’t have to pay them upfront. Not all lenders support this option, and the total mortgage must be under the Loan-to-Value Ratio (LTV: ratio of a loan to the value of the home). For example, if the lender allows an 80% mortgage value, based on your credit score, on a $190,000 home, the total mortgage is only allowed to be $152,000 including all fees. If closing costs are included in your mortgage, your monthly payment will increase and you may pay a higher interest rate. Sometimes agents will include closing costs as part of the contract negotiations. They will ask the seller to contribute to the closing costs. This works great when sellers are highly motivated to make a deal, but when housing inventories are low and there’s a lot of buyer competition, sellers are less likely to agree to pay closing costs. 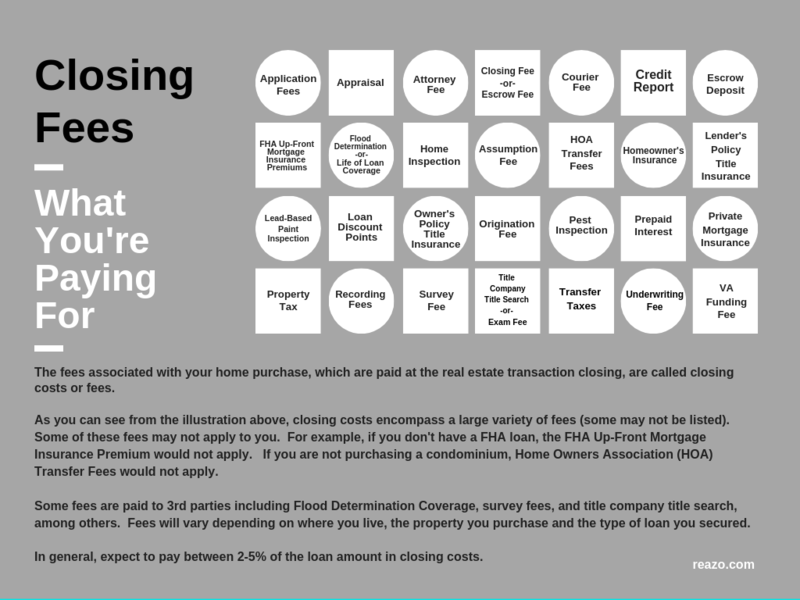 When it comes to closing fees, there are some fees you can lower and some that you cannot. Origination charges are common at closing. Lenders charge this standard fee as for getting you a loan (their commission). Sometimes lenders will waive these fees, especially if you have really good credit. You may be able to find better deals on certain fees and services. These include title services and lender’s title insurance, the home inspection, postage, survey, attorney, closing and settlement fees, and miscellaneous services. There are some fees that you won’t be able to get around and they include appraisal fees, credit report fee, flood certification, government recording fees and transfer fees. Pre-paid fees, amount you paid in advance for items you’ll regularly pay as a homeowner, include prepaid homeowners insurance, mortgage insurance premium (depending on the size of your down payment), and pre-paid daily interest. You may be asked by your lender to pay some money toward an escrow account to cover homeowners insurance. This is down in case you fail to make a payment in the future and is common when your down payment is less than 20%. Property taxes also come into play at closing. To ensure you stay current on property taxes, an escrow account for taxes is set up to decrease the likelihood of the government putting a lien on the house due to unpaid taxes. Owner’s title insurance is optional but will be included in closing costs. This insurance covers you in the event there are issues with the title and would protect you from financial loss. To get a better idea of the amount you’ll pay at closing, consider an online closing calculator or talk to your mortgage company before the closing. Closing costs vary from state to state and lender to lender so it’s always wise to comparison shop to protect yourself from paying higher than necessary fees. The closing date will be specified in your contract, but the amount of time it takes to close can vary greatly. A closing can take up to 6 weeks depending on the type of sale (all cash vs. mortgage loan) and it can vary by state. If you aren’t paying all cash, the length of time will depend on your lender. Even if you and the seller agree to an specific closing date, if the lender cannot completely finalize the lending process by that date, the home will not close on time. If your lender has verified your employment, bank accounts, and credit report, your closing may be completed in a week or two but it’s more likely that it will take up to 6 weeks. Most federal mortgage loans close within 30 days. It may take up to 35-45 days to close if you’re taking advantage of first-time home buyers programs, specifically those with down payment assistance. Be aware that you won’t simply be signing 3 documents. You will be verifying a lot of information and initially a lot of sections. It will take time and you may have questions along the way. Be patient and know that once you’re finished, you will be the proud owner of a home. Congratulations on the purchase of your new home! There are a few things you’ll want to do now that you’ve got the keys to your new home. Whether you’re purchasing a house for the first time or you’ve purchased multiple homes over the years, there’s a lot to be learned from the experiences. We wanted to include some “wish I’d known” information to help you and anyone you know that’s considering buying a home. What comes with the house. Make sure you know what comes with the house before finalizing the purchase agreement. Your contract will state if the seller has excluded appliances or other fixtures from the sale of the home. For example, the seller may choose to take the new refrigerator with them when they move. This must be stated in the purchase agreement. Do the shelves in the garage come with the home? The chandelier? The outdoor storage shed? Title insurance discount. Did you know that if you use the same title company for your second home as your first home you can get a discount? If you’re in a buyer’s market, you may have room to negotiate with the seller to cover part or all of the cost of the title insurance. In some states, like Florida, you can get a discount on your title insurance when buying a new home, if you have title insurance from a home you own or a previously owned. This type of discount is called a Reissue Rate. Before closing on a the new home, you provide proof of prior policy in order to qualify for credit towards the new title insurance. Reissue rates can save you $100’s to $1000’s. Water pressure. When you’re considering buying a home, flush the toilets and turn on the water to check the water pressure. There’s nothing like buying a house, moving in and finding you hardly have enough water pressure to take a shower. When were major appliances installed. When buying a home, learn when major appliances were installed, if they were purchased new or used, and from where they were purchased. Have your real estate agent ask for proof of purchase and warranties. When it comes to HVAC (heating and cooling), find out when the furnace was last replaced and how often it’s been serviced (might look at the filter too). Roof. Find out when the roof was last replaced and if a manufacturer’s warranty is still in effect. Depending on the type of shingles, they can last anywhere for 15-30 years but climate and weather conditions need to be taken into consideration too. Find out who installed the roof and if any repairs have been made. School district. If you have children and want them to get a good education, look into the school districts in the neighborhoods you’re most interested in. The quality of school districts matter, and the price of homes may go up in areas where schools are ranked the highest. As you do your research, you may find that many sites rank schools based off of average test scores. That’s a good place to start but it doesn’t tell you everything you need to know to make the most informed decision. Find out the ratio of kids per teacher, whether or not kids have enough time for recess, whether or not they have language immersion programs (bilingual), and if they have specialty programs (ex. autistic sector). Tour the school, talk to the teachers, drop into a PTO meeting, and learn about the diversity of the curriculum. Signs of flooding. If the home you’re interested in has a basement, look for signs of flooding. For example, watermarks on the walls, very little stored in the basement, boxes and appliances up on blocks. Declaration of Homestead. Have you ever heard of a Declaration of Homestead or Homestead Declaration? It’s an inexpensive way to protect your home from being seized and sold if a money judgement is entered against you. Montanans, for example, can protect up to $250,000 in the value of their home against the majority of creditors’ claims. So if a Montanan has a gambling debt, up to $250,000, the value of the home would be protected against creditors. This may not be available in all states. Mineral and water rights. Did you know the purchase of a property doesn’t necessarily include mineral and water rights? This means that someone else, who has the rights, can dig for minerals (ex. coal, gas) and water despite the fact that you own the property and home. You’ll want to talk to your real estate agent or an attorney, especially if there isn’t a mineral and water rights disclaimer in your purchase agreement. To get a copy of your deed, talk to your County Recorders Office. Live below your means. If you want to save money for a down payment, it’s a good idea to live below your means and find ways to cut daily expenses. Focus on the benefits this will provide you in the future. Sell your vehicle, especially if you’re making payments, and buy a reliable used car or truck. Pay for the used vehicle in full to eliminate monthly payments. If you’re renting, consider finding a lower priced rental or moving in with family to save money. Licensed home inspector. Don’t skimp when it comes to hiring a licensed home inspector. If your real estate agent recommends a home inspector, do some background research before agreeing to hire him/her. You want an inspector with an outstanding reputation and someone that takes time to do a thorough investigation of the home, bringing in other specialists when necessary. You want someone who can pinpoint issues so they don’t become future, costly repairs. Negotiate. Don’t be afraid to negotiate. A good real estate agent will be able to provide suggestions for negotiating the purchase agreement. If you feel like your agent isn’t a good negotiator, consider asking to talk to the broker or another highly experienced agent to get help with negotiating. Ask family and friends which negotiations worked in their favor and consider using them yourself. Whether you’re negotiating for a lower purchase price, more affordable title insurance, or want the new washer and dryer included in the final sale, discuss these negotiations with your agent. By arming yourself with the home-buying knowledge provided in this article, you'll be able to make a very educated and informed decision about purchasing a home. As you begin your home search, create a budget, take time to find a good agent and get pre-approved for a mortgage. When you find a home you wish to make an offer on, work with your agent to come up with an offer that falls within your budget and is competitive in the current market. 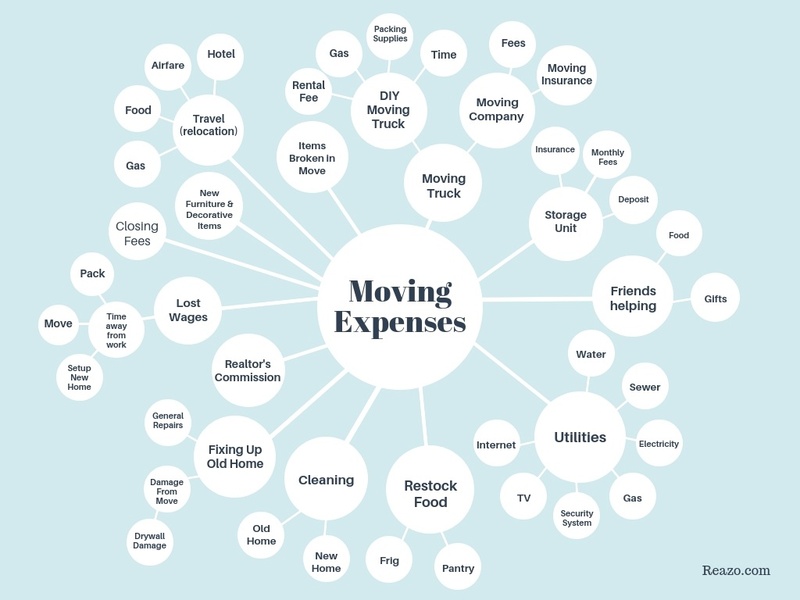 Factor in additional expenses, like moving costs and insurance, to avoid breaking the budget. When the closing comes around, you'll be armed with enough knowledge to smoothly sail through the process. Once you've closed on your home, you can rest assured that you've made a well-informed decision and purchased a house that will meet your needs for many years to come.